Backed with immense industry-experience and knowledge, we are offering a comprehensive assortment of Special Application Fasteners. 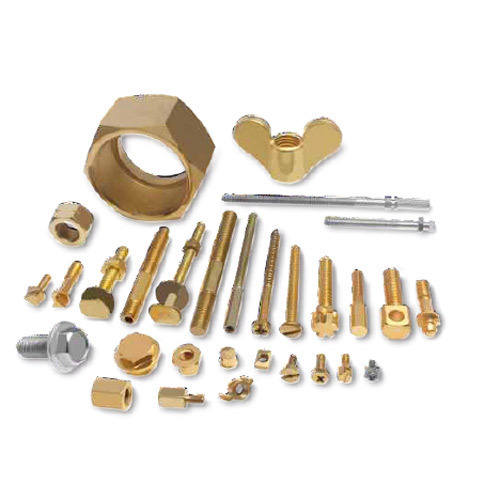 Offered fastener is manufactured from the top notch material & latest techniques in fulfillment with the norms of industry. This fastener is tested in terms of quality in order to supply a defect free range. Also, clients can avail this fastener from us in numerous specifications at affordable rate. Established in 2006, we, United Brass Industries", an ISO 9001: 2008 Certified Company the most encouraging manufacturer, importer, exporter of Brass CPVC PPR Fittings, Brass Fasteners, Copper Accessories, Mild Steel Fasteners, Brass Precision Components, Copper Precision Components, Brass Sheet Metal Components, Copper Sheet Metal Components, Brass Molding Inserts, Brass Panel Board Accessories, M.S. Rack Bolts and EWC Bidet GI Screw Set. At the essence of our growth is the support of an underlying notion of creating a solid bond with our clients. This vital guiding perspective encourages us to better interact, connect and generate the most innovative product series that will delight our end users to the core. To achieve this efficiency, we develop insightful company procedures by implementing technological improvements and solicitation of constant market courses. We believe our encouraging growth would not have been feasible without our state of art production support and the pool of most dedicated men who compensate for nothing else but mastery.